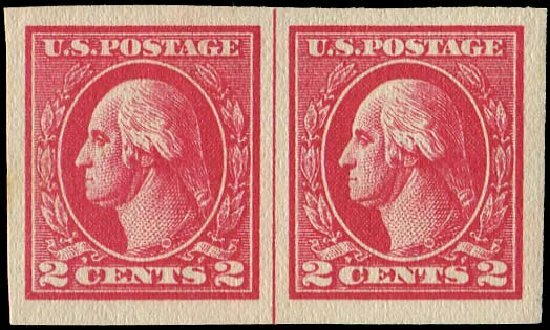 USA (Scott 534B) 1920 WASHINGTON 2¢ CARMINE TYPE VII IMPERF, LINE PAIR (PF GRADED 95) Scarce horizontal imperforate pair with vertical guide line at center. One of the finest known examples! Fresh, MINT never hinged, extremely fine to superb. (2005 PF Graded Cert #431082, XF-S 95; plus 2003 PF & 2000 PF Certs) Cat value $6400. 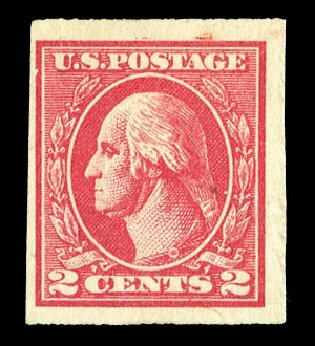 1918, 2¢ carmine, Offset imperf, type VII (Scott 534B), o.g., never hinged, well margined example of this rare type VII stamp in immaculate mint condition, with outstanding rich color and detailed impression, Extremely Fine. Scott $3,500. Estimate price $3,000 – 4,000. 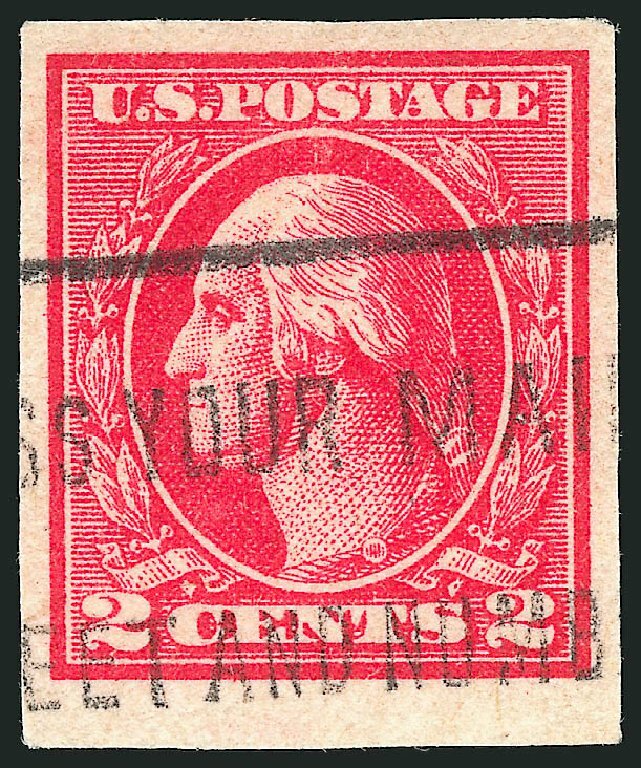 1918, 2¢ carmine, Offset imperf, type VII (Scott 534B), o.g., previously hinged, absolutely extraordinary GEM QUALITY example of this rare type VII stamp, large margins including a small portion of the sheet margin at top and vibrant rich color, a matchless example destined for the finest collection, Extremely Fine, 1980 P.F. 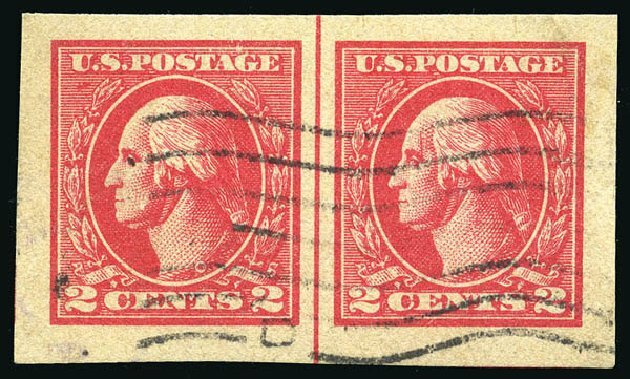 certificate for horizontal pair, from which this scarce stamp was taken, this being the left stamp from the pair. Scott $1,850. Estimate price $2,000 – 3,000. 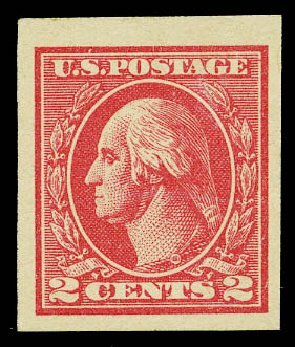 1918, 2¢ carmine, Offset imperf, type VII. O.g., barest trace of hinge, attractive balanced margins, bright color on fresh paper, Extremely Fine, with 2006 P.F. 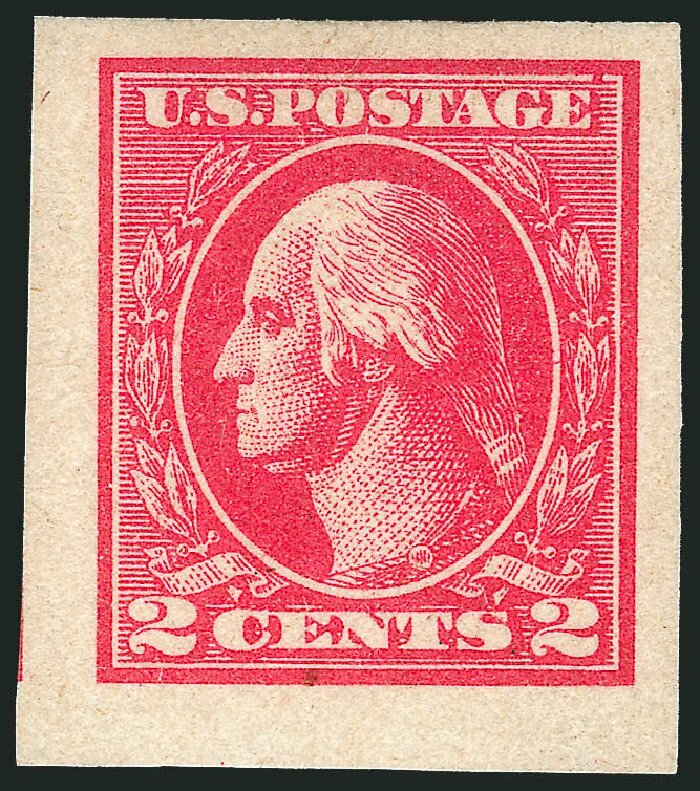 Graded certificate (XF 90, SSV $2,100). Scott No. 534B; $1,850. 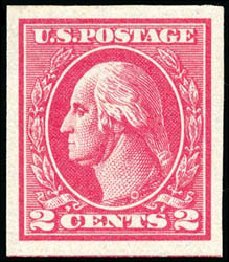 A PREMIUM MINT EXAMPLE OF THE 1920 2¢ OFFSET IMPERFORATE TYPE VII ISSUE. 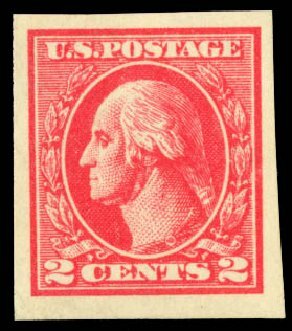 1918, 2¢ carmine, Offset imperf, type VII. 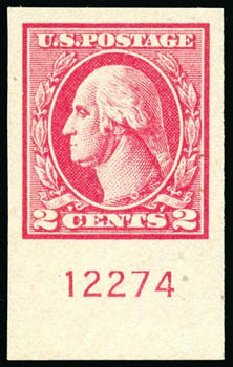 Bottom margin plate number “12274” single, o.g., never hinged (lightly hinged in selvage only), large evenly balanced margins around, strong bright color, Extremely Fine, with 1993 and 2002 P.F. certificates. Scott No. 534B; $3,250. 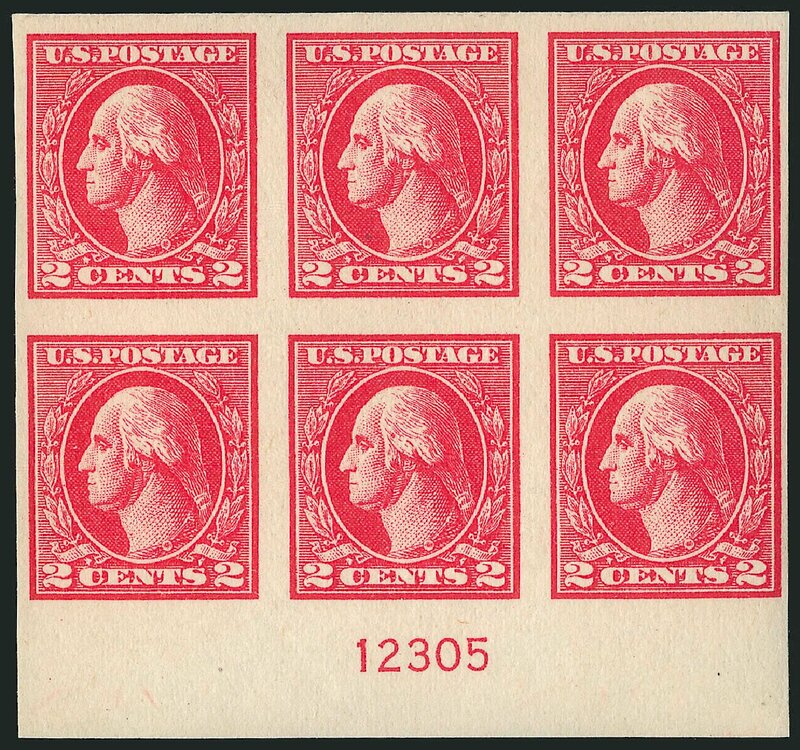 AN EXCEPTIONAL EXAMPLE OF THE 1918 2¢ TYPE VII IMPERFORATE ISSUE. 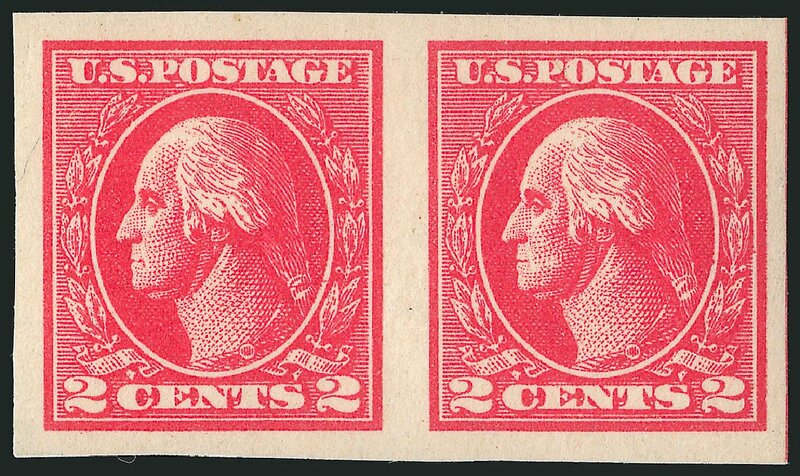 o 1918, 2¢ carmine, Offset imperf, type VII (534B), horizontal pair with verticle guide line, huge balanced margins. Light machine cancel, bright color. Small filled thin. Otherwise Extremely Fine. 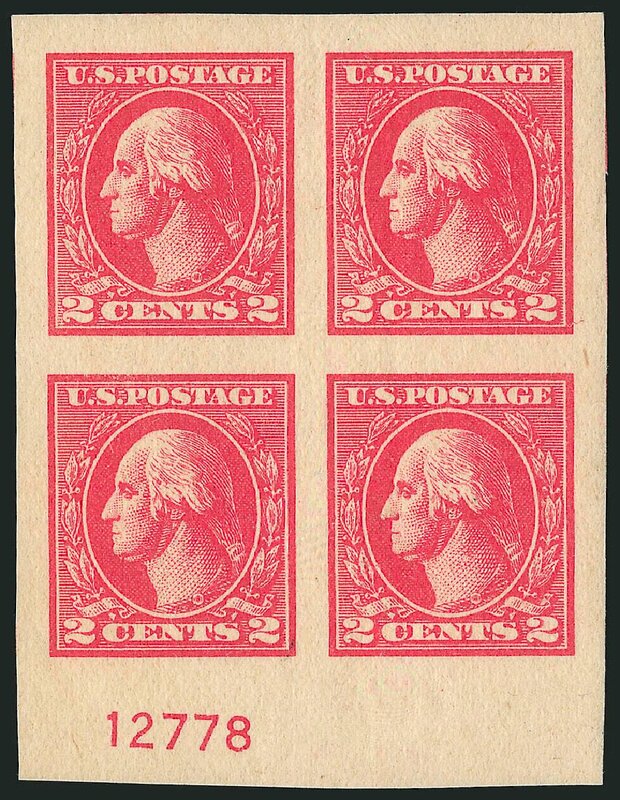 Scott value $4,500 A SUPERB APPEARING EXAMPLE OF THIS RARE USED MULTIPLE, OF WHICH PROBABLY NO MORE THAN 12-15 EXIST. Expertization: 2003 P.S.E. Certificate. 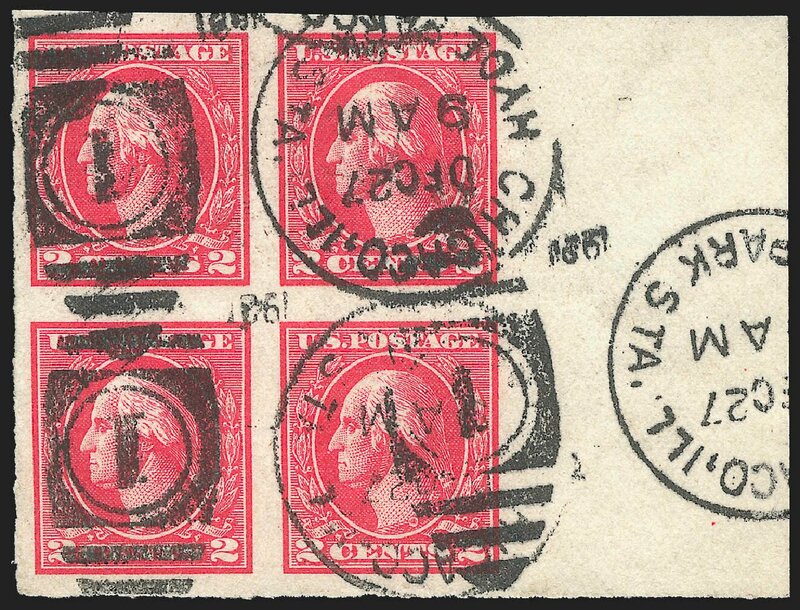 o 1918, 2¢ carmine, Offset imperf, type VII (534B), horizontal pair, very large margins with sheet margin at left, brilliant color. Neat Chicago slogan cancel. Fresh and choice Extremely Fine. 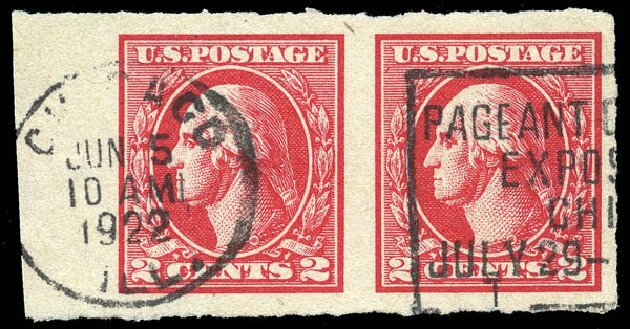 Scott $4,500 AN EXQUISITE USED PAIR OF THE 2¢ TYPE VII IMPERF, WITH ONLY ONE PAIR GRADED HIGHER BY EACH THE PHILATELIC FOUNDATION AND THE PROFESSIONAL STAMP EXPERTS. Expertization: 2014 P.F. 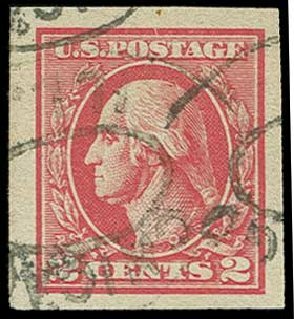 Certificate graded XF 90.